Lately, she has infused deeper textures into her imaginative mixed media pieces, bringing them to life like her 3-D houses and animated guitar paintings that ignite the senses and pull at our heart strings. Personal yet powerful, Carole’s constructivist art is a reflection of her joyous connection with the magical beauty of her surroundings. Meet Carole Sesko, contemporary artist from Truckee. Working out of her quaint studio above historic downtown Truckee, Carole creates original paintings, mixed media collage, and functional art. She has also played an integral role in the progression of the Truckee and North Lake Tahoe art scene over the years. 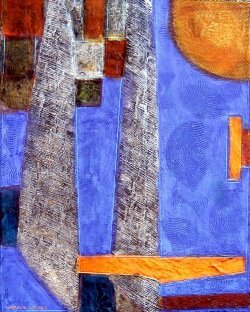 Coming from an architectural design background, Carole’s artwork integrates a variety of coloring and layering techniques to explore our collective experiences of time and place. 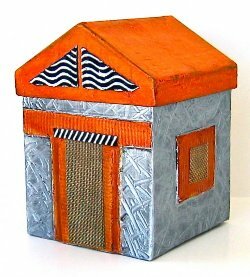 Most of her pieces include a mix of acrylic paints, wood, canvas, paper, metal, textiles, and a variety of recycled objects to add texture and context. She started painting with acrylic on canvas in 1993 and eventually developed her signature style of layering metallic paint with solid colors to achieve iridescence and vibrancy. She states that her color palette changes each year, adding that she’s never found a color she didn’t find interesting. 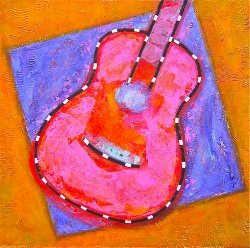 Along with powerful colors and textures, music has also influenced her work. My art is process driven. I strive to balance matte, sheen, color, pattern, and texture until the components unify and flow. My subjects range from figurative to abstract, and each art work leads me to explore my next new idea. My life long love of music influences my paintings. Before I turned to visual art, I studied piano and guitar, music theory, history of western music, and ethnomusicology. My approach to art is similar to creating a musical composition, balancing structure, rhythm, harmony, and vibration. When my paintings are finished, they sing. Carole is originally from the Berkshires in Massachusetts, where she received her Associate of Arts degree from Simon’s Rock College, followed by a Bachelor of Science degree in Design from the University of California, Davis. She has lived in Truckee for more than twenty years, and has helped coordinate art exhibits such as ArTour, collaborative projects, and public art installations around Truckee, Lake Tahoe and Reno, Nevada. Carole opens her Truckee art studio to the public several times a year and by appointment. Contact Carole at csesko@sbcglobal.net or call (530) 412 0639 if you would like to set up a time to visit, or to join her email list. See more of Carole’s art work and learn about her artistic process by visiting her new website at www.carolesesko.com.